YASMINA Reza has an almost uncanny ability to slice through the veneer of liberal, intellectual charm of the middle classes, and reveal the primitive barbarian beneath. It makes some people uncomfortable. It makes others laugh – it’s a slightly edgy sort of laughter, because we know we are laughing at ourselves, and we don’t much like what we see. 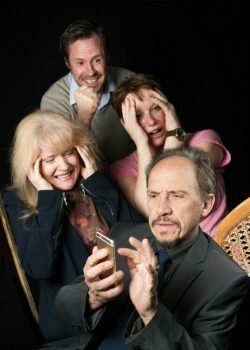 Salisbury’s versatile Studio Theatre chose Reza’s God of Carnage for the summer show – and it would be impossible to over-praise this brilliant, insightful, acutely observed production. Reza’s first big hit was Art, a play that is ostensibly about the reaction of three friends to the purchase, by one, of a piece of contemporary art. What it is actually about is the nature of friendship, particularly friendship between men – what happens when the mask of civility and geniality drops. In her four-hander, God of Carnage, she excoriates the polite facade of two couples, brought together by the not unusual occurrence of boys scrapping in a playground. It may be a manicured, peaceful urban park not a gang-ridden, graffiti-daubed scrap of tarmac. But it’s the same thing – boys will be boys. It is, of course, unfortunate that when Frederic and Bruno fall out, Frederic hits Bruno with a stick and knocks out two of his teeth. Frederic’s parents go to see Bruno’s parents … to do what? To apologise? To offer to pay for the child’s orthodontic work? To have a civilised cup of coffee, exchange meaningless social pleasantries and depart, patting themselves on the back for the urbane success of their lives? It doesn’t quite work out like that. Over 90 minutes of coffee, clafoutis, vintage rum and increasingly vicious verbal exchanges, Bruno’s parents, businessman Michel and the socially-concerned culture vulture Veronique, and Frederic’s father, international lawyer Alain and mother, wealth manager Annette, lay bear the hypocrisy, isolation, insecurity and selfishness that lurk beneath their sophisticated exteriors. They are all at the mercy of the God of Carnage (listen carefully as the cynical Alain explains his theory of life and you will understand the title). Veronique (Sam Luckman) is revealed as a pretentious bleeding heart liberal, while the elegant and sympathetic Annette (Pam Edmund) is an arrogant snob when the gloves come off. Michel (James Paterson) has a chip on his shoulder and a simmering resentment og his do-gooding wife. Alain (Keith Edmund) is the most intelligent, the most unpleasant and the most abrasively honest of the four. The action is constantly interrupted by Alain’s mobile phone, as he handles the tricky business of a damaging report on the side effects of a drug produced by a pharmaceutical company which is his firm’s biggest client. Photograph by Anthony von Roretz. Posted in Reviews on 12 July, 2018 .